Today�s review is something a little special. 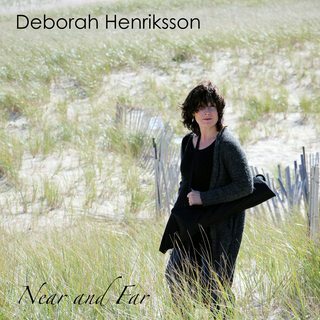 My friends at Bongo Boy have asked me to re-view the new album by Deborah Henriksson. Deborah, like myself grew up in the US, but is also a citizen of Sweden. I had heard a few of her songs before on earlier Bongo Boy compilation albums and remember thinking that she has a great voice as well as noticing her last name. Track 1 - Face Your Fears - The intro to the song really grabs the listener�s attention. The acoustic guitar is beautiful and memorizing. The drummer comes in with an unusual beat and the Deborah�s voice begins. The thing that strikes me is the beauty of this song. I hear what sounds like a keyboard, a flute and various stringed instruments that ebb and flow as Deborah�s angelic voice floats over the top. Track 2 - Breakers� Roar - I really like the Celtic vibe of the guitar that is playing as Deborah begins to sing. Is that a violin I hear? It might even be bag pipes, I can�t really tell, but there is a fairly high-pitched instrument that simply jams as their drummer goes into a march like roll-ing beat. Then the band quiets down a bit and the listener can only hear Deborah who sings incredibly well. This last for a phrase or two before the band comes back with full intensity and what I think must be meant to invoke the imagery of waves crashing - hence the breakers� roar. Track 3 - In Time - This is a slower song than the first two. Personally, I think this song has a bit more soul than the first two, but that is probably simply because the music being played is closer to the music I grew up with. I don�t know if it is intentional, but I hear a strong Country/Blues vibe in this song. I could imagine this song on a Stones album when Mick Tay-lor was with the group. Track 4 - Through The Leaves - I really like the beginning of the song although I am not exactly sure what stringed instruments are being played. The groove is hypnotic. There is a violin and the thump of a drum while Deborah coos softly. The drummer kicks in with a rolling beat while the band turns the volume up a bit and Deborah�s coos morph into something stronger, more intense, but no less beautiful. You really need to listen to this track. The music is interesting and the vocals are spectacular. Track 5 - Wild Fire - This song begins more like a song I am used to hearing. The guitar at the beginning is captivating and the beat is relatively simple compared to the other tracks on the album. I really like the odd little jams that various stringed instruments and perhaps a synthe-sizer throw in before the guitar steps up and takes a solo. On top of all of this is Deborah who really has one of the most beautiful voices I have ever heard. Track 6 - Share This Moment - The guitar starts out with a mellow, yet forceful vibe while Deborah totally dominates with her magical voice. In this song, more than the others on the album, I have the feeling that the band is playing a supporting role. Don�t misunderstand they are all good players, but there is no doubt that this is Deborah�s song - even during the jam towards the end of the track when the other musicians get a chance to shine, it is Deborah that I am really listening to. This is a very good song! Track 7 - Shine - I like the intro and the easy to follow rhythm. The music sounds, to me, very bright and cheery. The vocals, as I have come to expect are simply beautiful. The guitar throws in some really nice leads that totally fit with the song. There is no question that this band makes fantastic music. As I was writing this review the littlest Grouch, my nine year old son, came into the room and said �Papa, that sounds really good!�. Track 8 - Whisper - The rain effect at the beginning is kind of cool, but what I really like is the guitar. Again, I hear a bit of a Country/Blues influence in this track. The music sounds really good. Deborah sings beautifully, but I find myself drawn to the guitar and keys as they play off her voice. The guitar solo reminds me of something Mark Knopfler might play. All in all, this is one of my favorite tracks on the album. Track 9 - Summer Roads - Very cool intro as this is the first track on the album where the first thing I hear is the percussion. I dig his beat. The strings pick up the funky vibe as Deborah sings about falling in love. This is simply a wonderful song that makes me happy. I find my-self keeping time and moving my head back and forth. Track 10 - Wide Open - This song begins with a hypnotic groove that grabs my attention and then that fantastic voice comes in and really sends the song over the top. Simply put, Debo-rah�s voice is so good she could sing an advertisement for laundry detergent and it would sound good. When you put her together with players of this caliber the outcome is truly amazing. beautifully sung melodic music you will absolutely enjoy this album.